Please a crowd with these easy, flavor-packed mini-sandwiches. Just cook some chicken, and jazz up some purchased hummus with avocado, capers and olives for a slider that keeps the party going. Heat oven to 400°F. Lightly oil a sheet pan. 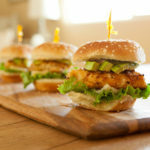 Cut each chicken breast portion in half to make two even, slider-sized portions and place the chicken on the pan. Sprinkle with salt, pepper and thyme. Roast for 20 minutes, until an instant read thermometer inserted in the thickest part of a breast reads 165°F and the juices run clear. Cool the chicken on a rack until cool enough to handle. Halve the avocado, remove the pit, and cut the flesh, still inside the skin, into dice and scoop into a medium bowl Add hummus, capers and olives and stir. On each bun, place a couple of spinach leaves, a piece of chicken, and top with about 3 tablespoons of the hummus mixture. Cover with the top half of the bun, using a toothpick to hold it together, if desired. Place sliders on a platter and serve.